Notch filters are used to block a narrow range of wavelengths. 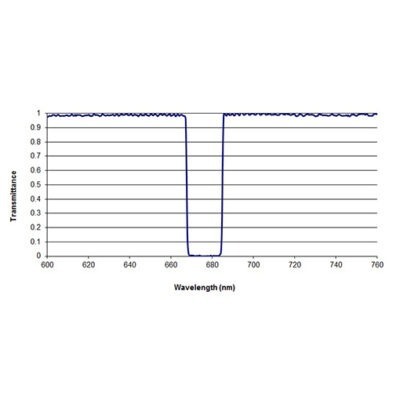 In Raman spectroscopy, this allows observation of Stokes (long wavelengths) and Anti-Stokes (short wavelengths) scattered light while blocking the laser line. High transmittance in the passband and deep blocking at the excitation laser line (OD > 6) provides more signal with less background. Iridian’s notch (and multiple notch) filters are among the narrowest dielectric thin film notch filters on the market. Like all Iridian sputtered filters, our notch filters use hard dielectric coatings, offering superior reliability and affordability compared to holographic notch filters. Iridian has two grades of notch filters to choose from.